An agreement to end a dispute between the city of Harvey and two public safety pension funds provides a glimpse at the impending fiscal crises stemming from government pensions across the state. An ongoing pension crisis in Harvey, Illinois, could be a warning sign to state and local governments across the state that the current system for funding government worker retirements is unsustainable. Without reforms – such as a constitutional amendment to allow reductions in the future growth of benefits, or bankruptcy for the worst cases – pensions will lead to calls for tax hikes and cuts to core government services. The city of Harvey reached a settlement agreement on July 23 with its two public safety pension funds; the agreement divides up state tax dollars due to Harvey, which the Illinois Comptroller had been withholding, between the city and its two public safety pension funds, according to reporting by the Associated Press. 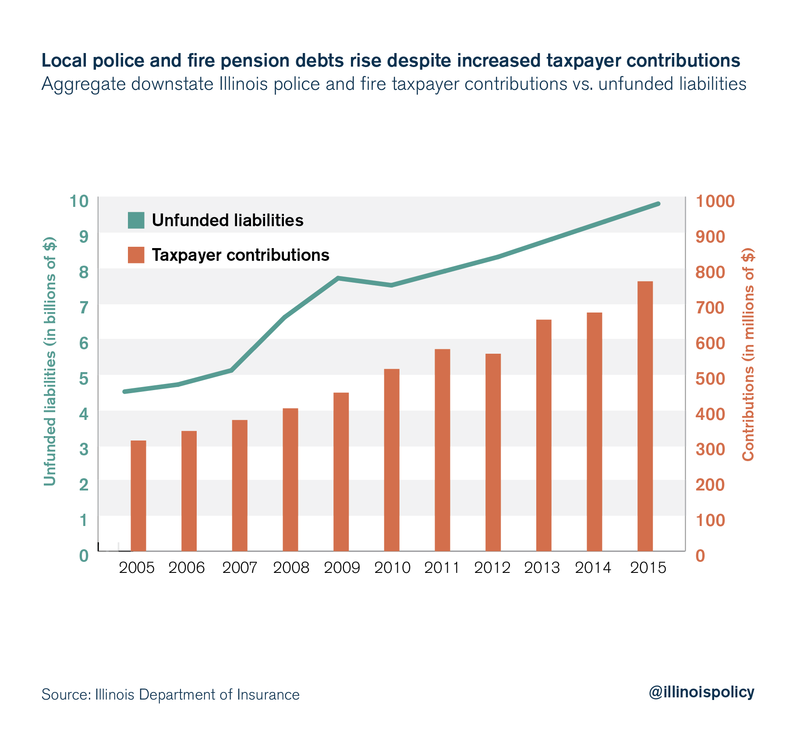 After the city failed to make payments to the pension funds as required by state law, the Illinois comptroller began withholding state tax revenue from the city to distribute to the police fund, the first to claim the delinquent pension payments. The firefighters fund then made its own claim on the withholdings, effectively blocking the pending agreement between the city and the police pension fund. Harvey reached a short-term agreement with the police and fire pension funds and city bondholders in June to access $1.3 million of the withheld funds so it could meet payroll and settle outstanding bills from vendors. The Illinois comptroller has withheld approximately $3.3 million in sales, income, local use, transportation, motor fuel, replacement and excise tax revenues from Harvey since February. The most recent agreement is intended to resolve the dispute and would allow Harvey to access about $1.65 million of that money. The rest will be split between the pension funds and bondholders, according to the Associated Press report. In coming years, 35 percent of the state revenue for Harvey will go toward the police and fire pensions, according to the Daily Southtown. The city owes $9 million to the police pension fund and $14.2 million to the firefighters’ pension fund. But it is doubtful whether Harvey can even achieve full funding of either fund, settlement or not. The city of Harvey owes over $87 million in pension debt, and has already been forced to cut services due to financial pressure to pay for retirement costs: Harvey laid off one-quarter of its current police officers, more than half of its other police department personnel, and 40 percent of its firefighters in April, the Daily Southtown reported. Harvey’s total revenue in 2016 was less than $48 million, while its expenses topped $53 million. Its effective property tax rate is already one of the highest in the state at 5.7 percent for residential properties, and the city’s property values are some of the lowest – Harvey’s median home value is less than $73,000, and median household income is less than $22,000. Cities in similar financial straits have had to file for bankruptcy to bring about significant financial sustainability. Without any reforms to help with Harvey’s pension liabilities, this “long-term” settlement probably won’t last. Laying off firefighters and police officers as a result of pension-related financial pressure is an extreme case of pensions crowding out core government services. And a history of corruption and mismanagement has exacerbated the financial pressures on the inherently unsustainable pension systems affecting this south Chicago suburb. But Harvey is one of many governments experiencing increasing difficulty in paying for current services while also paying for past services in the form of retirement benefits. Nearly 60 percent of Illinois’ police and fire pension funds did not receive full payment in 2016, according to research by Wirepoints. As with Harvey, this puts those municipalities at risk of withholding by the comptroller. They too could face the choice of tax hikes, service cuts – or both. Liabilities have continued to rise despite increasing taxpayer contributions, meaning pouring more money into the system has done little to solve the problem. Worse, the liabilities are growing far faster than taxpayers’ ability to pay for the benefits, with growth in local pension promises outpacing the growth in investments, taxpayers’ incomes, inflation and population. And local governments’ pension difficulties are only the tip of the iceberg. Illinois’ five statewide pension funds have between $130 billion and $250 billion in unfunded pension liabilities, depending on who’s doing the analysis and what assumptions they use. Pension payments already make up over 25 percent of state general funds spending each year, and those payments are projected to increase going forward. 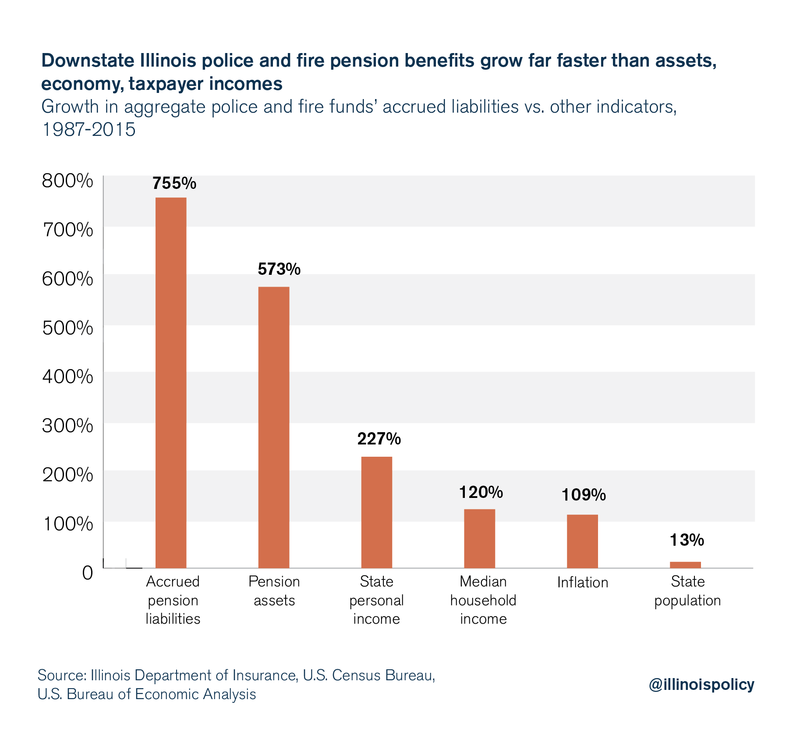 Ultimately, Illinois has two options to address pension liabilities: tax hikes or reform. The tax hike route threatens to inflict more damage on Illinois’ economy and drive residents out of the state. And thanks to the Illinois Supreme Court’s interpretation of the Illinois Constitution’s pension protection clause, the reform route requires a constitutional amendment. Amending the Illinois Constitution will take time and political courage, but it is necessary to save local governments and the state of Illinois from the financial ruin already gripping Harvey.